Jim Jenkins has been racing on foot and wheels for 30 years. He rode across the U.S. in 2013, hiked the entire Appalachian Trail in 2008-9. He has completed many adventure races and has climbed Mt. Rainier and Mt. Kilimanjaro. Brad Patty is a finisher of T.I. V9 (2013), his only T.I. started. He has finished several Leadville Trail 100 MTB races as well as Almanzo 100, Lutsen 99er, Buffalo 105, Wausau 24, all on a mountain bike. Matt Scotton is a finisher of T.I. V9 (2013). He rode 296 miles of T.I. V10 but was forced to abandon due to exhaustion and cold. Matt is a 2-time Leadman, a series that includes the Leadville Trail 100 MTB Leadville 100 Run. His gravel grinders include: Almanzo 100, Royal 162, CIRREM, and Buffalo 105. 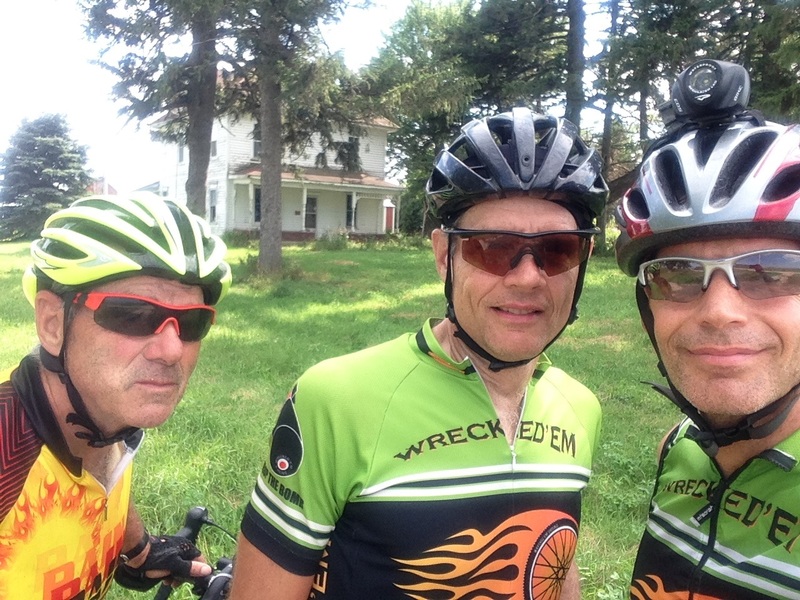 These 3 masters cyclists are from Newton, Iowa. They have been riding and racing together for 10 years. Brad – Rode a Cyclo-Cross (CX) bike built by Tom Ritchey called a Break-Away. One can disassemble the bike (the frame will come apart around the seat tube) so the bike can fly without the cost of oversized luggage. Otherwise, it is a normal CX bike with cantilever breaks. The wheels were PowerTap with Kenda Small Block 8 tires (700 X 32C). The computer was a PowerTap Joule GPS. Matt – Rode his trusty Motobecane CX bike. This bike has a single chainring on the front. It also has Bontrager paired spoke technology wheels. The brakes were standard cantilever. This bike was fitted with aero-bars, and a frame pack. 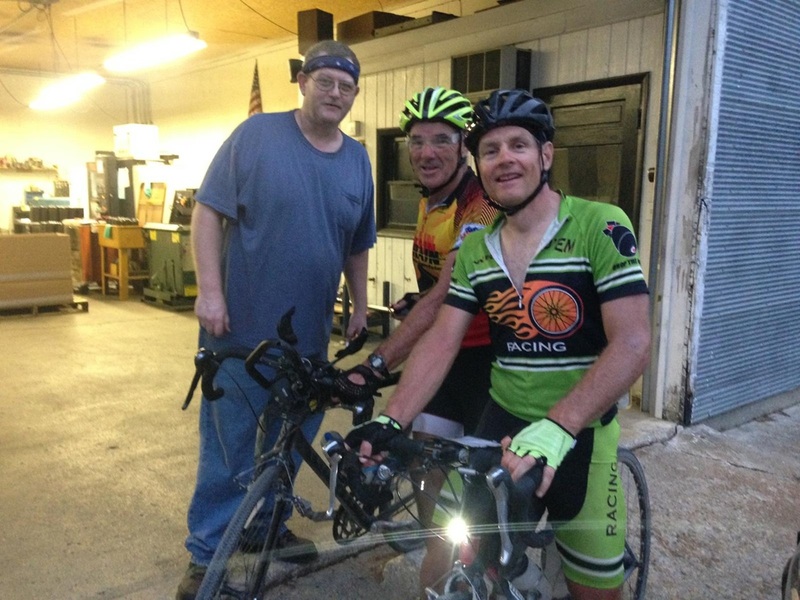 Jim – Rode a Giant CX bike with a rear rack. The brakes were standard cantilever. This bike was fitted with aerodynamic bars. Peterson at 4:15, & Linn Grove at 5:05. 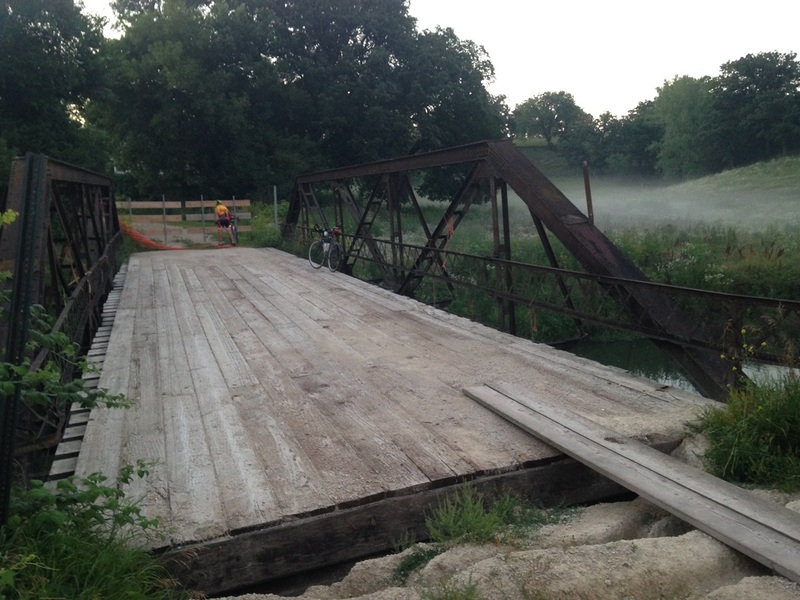 We crossed Hwy 71 at 5:45 and rode into Sioux Rapids for dinner (only a half mile off course down the highway). 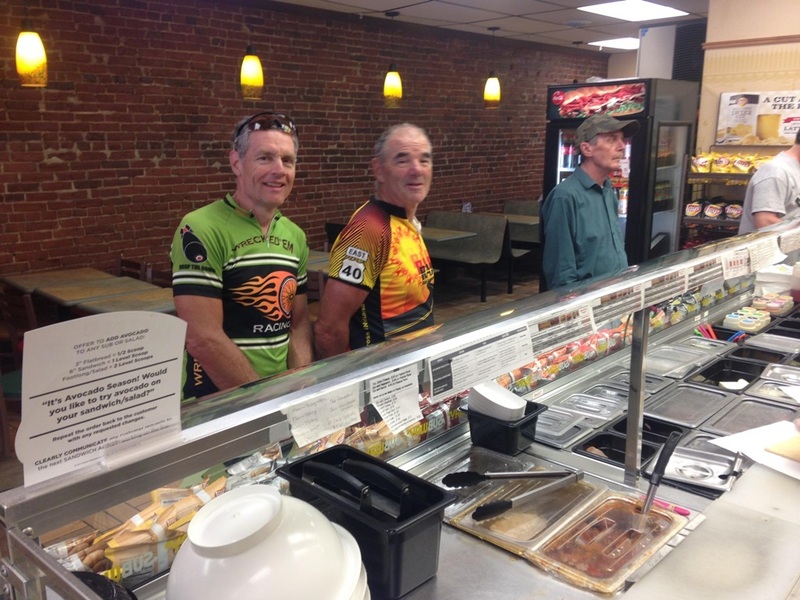 Matt bought his food at Sioux Center Foods grocery store and Brad & Jim ate at Casey’s General Store. We re-entered the course 40mins later and at 9pm we stopped in Mallard to get water for Jim at a loud rockin’ garage occupied by one working man that turned out to be Mallard Machining. We discovered a Sparky’s convenience store as we rolled out of duck-town in the waning daylight. In the first hour of darkness we battled dense mosquitoes. We were slowing down on our way to West Bend in the dark so we ate again there and improved our pace dramatically as we rode north to Algona (the SE wind that slowed us until late afternoon had shifted to come from the SSW). At 1:00a we arrived in Algona and found the Hy-Vee. We ate there, got chilled while sitting in the air-conditioned store and left their dining area to warm up and rest outside (on bags of water softener salt). We charged our phones and GPS devices in the Hy-Vee (outlet by the water-fountain in the dining area). We had planned to sleep an hour or so, but only slept 10 or 15 minutes. We left Algona at 3:00a to resume our gravel road expedition. On the edge of Algona, Jim’s light wouldn’t power on so we ended up replacing it with his back-up light (20 min stop under a street light with a brief visit from a passing sheriff’s deputy) and followed our gravel road course in the dark and fog to Crystal Lake. At 6:00a the gas station was still closed so we rolled on to Forest City’s Casey’s at 7:00a. Within an hour we were on our way to Pilot Knob State Park, found the unmarked equestrian / MTB trail through the north border of the Park to the East entrance to complete “Semester 1” of TIMP. We took pictures, battled mosquitoes, and began the second semester of our master’s program. Elevation: + 4787 / – 4635 ft. 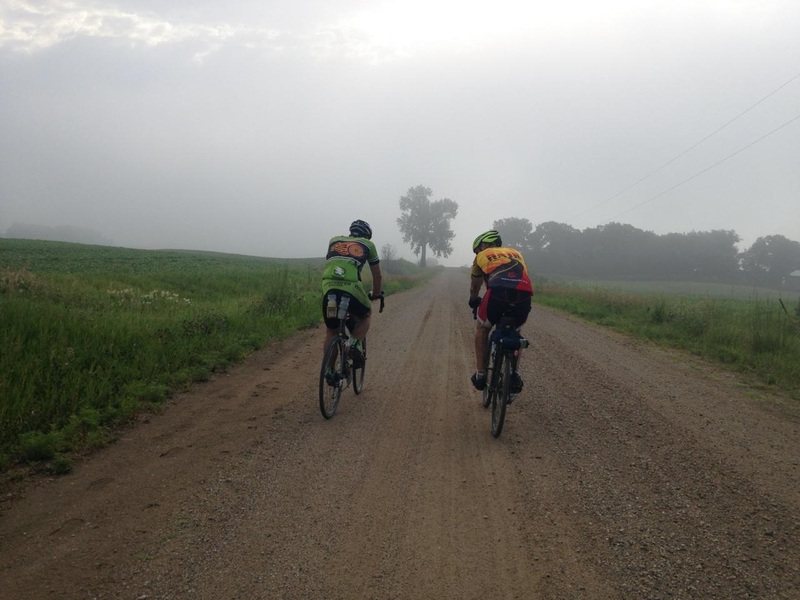 The morning fog was lifting as we rode the rolling hills away from Mile 200 and Pilot Knob State Park around 8:40a Saturday. We were getting pretty tired, but our speed ranged from 10-14 mph as we worked to get to Osage (mile 242) by noon. 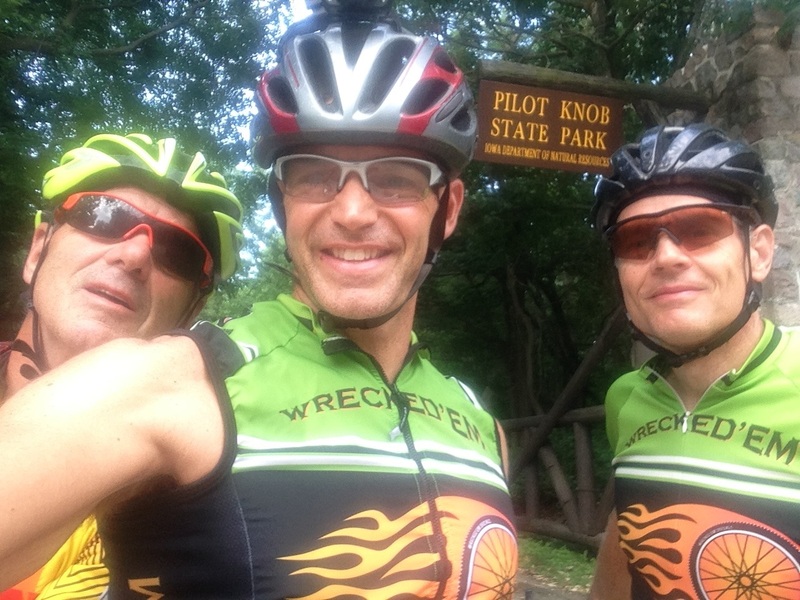 We encountered our first real hills of this epic event as we pedaled into Osage at our goal time. 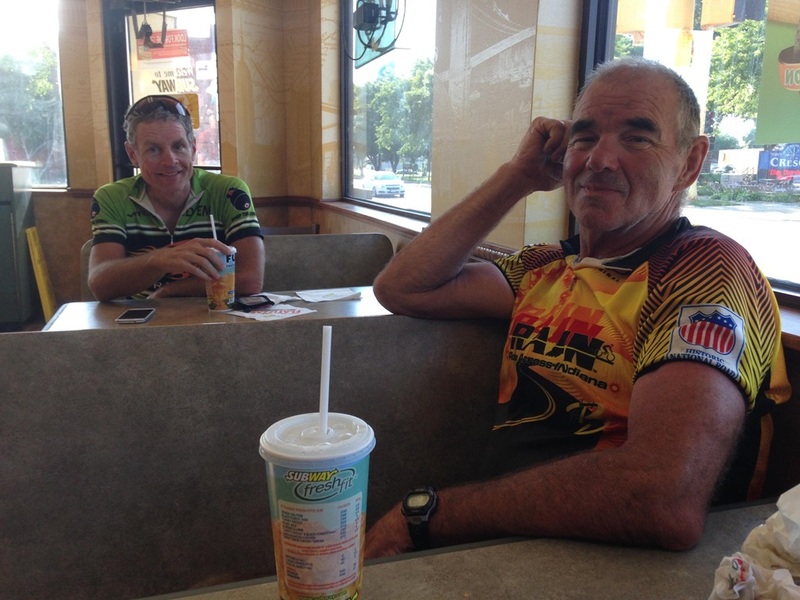 We ate at Subway and prepared to ride to Cresco. Jim’s back rack broke free from the seat post on a sandy Level B road. We repaired with black electrical tape. It was a humid day, but we didn’t get hot until the sun popped out around 3:30p. We stopped at a vacant farm at 4:20p and ate a snack in the shade. 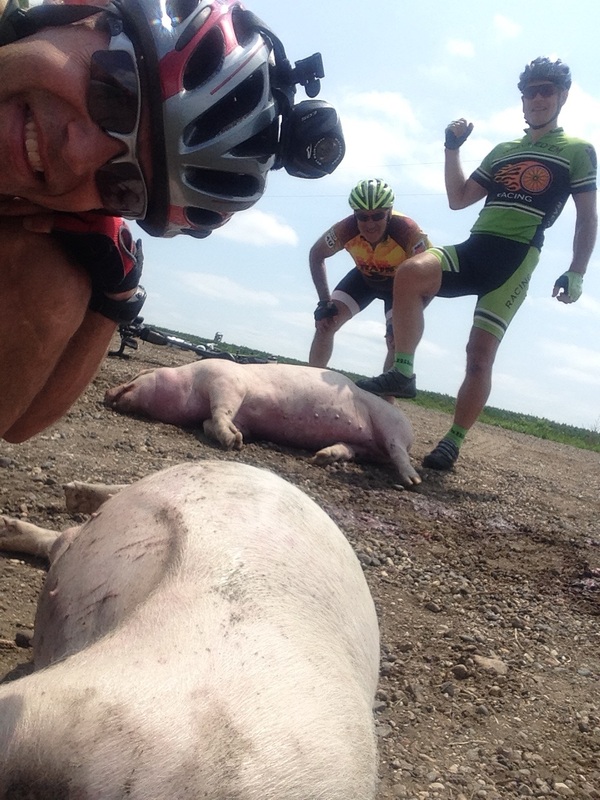 Jim is not especially chatty while riding, but he had stopped talking altogether on the way to Cresco. We arrived there at 6:00p, found the Subway & Fareway, and found Jim in a full-on “bonk” (hypoglycemia; aka low blood sugar). He wasn’t able to speak. After a game of charades, Brad ordered him Mello Yellow as Matt helped Jim off his bike and sent him into the Subway restaurant. Within 10 minutes Jim was able to speak and eat. After a line-waiting rush at Fareway we headed for Decorah via the rolling hills near the Minnesota border. This was the beginning of the real hills (and some that seem unreal). 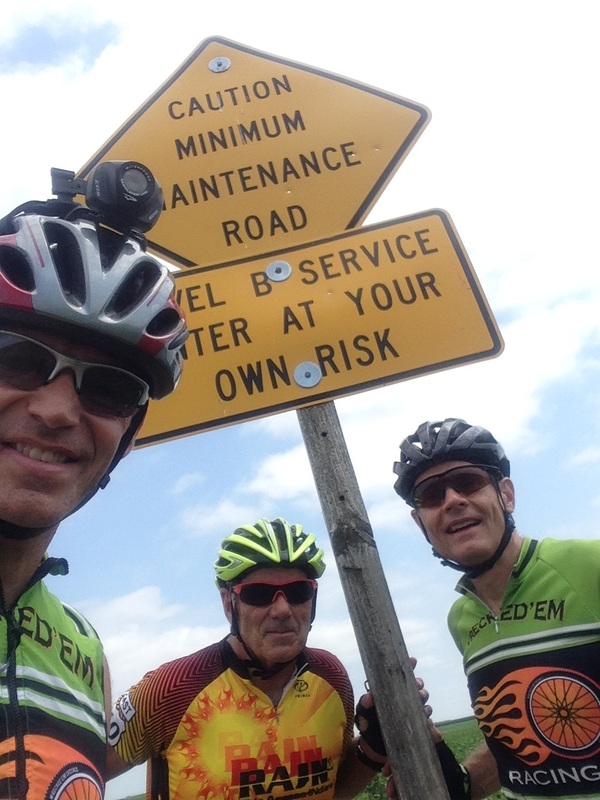 We headed north and powered up a super-steep hill as we turned east. In spite of our fatigue and sleep deprivation we were in awe of the beautiful Iowa landscape in this section. Somehow the beauty overpowered the difficulty. We took pictures on a trestle bridge near mile 300, saw lots of cows, a lot full of elk, and a deer crossing the road almost hit Matt as he bombed down a short hill ahead of the others. Around dusk Saturday we encountered a reflective driveway pole in the middle of a gravel road descent. It marked two electric fence wires across the road. Carefully, we got our weary bodies and heavy bikes over the oddly-placed hot-wires and found a closed bridge, sparkling stream, and foggy valley a few yards down the hill. Sunday we started the final leg of the course from Decorah to Lansing. We central Iowans know hills because it’s all we have in Jasper County, but we didn’t knowthere were hills as steep and long (in Iowa) as we found in this final 47 miles of TIMP. These wicked steep climbs began before we left the city limits of Decorah. We went straight up and straight down relentlessly in the dark for almost 6 and-a-half hours, sweating and huffing on the ascents and chilling and wide-eyed on the descents. Around 4:30a we had descended into a dark valley and came to a river crossing. We triple-checked our cue cards and worked to get our foggy sleep-deprived brains to focus on a debate of the route. We crossed the stream (shin-deep) and resumed our ride as the slow ascent began and light started to color the sky. As dawn arrived we continued to ascend and descend what appeared to be unrideably steep hills. The recently graded gravel roads got looser and deeper in the final 15 miles. 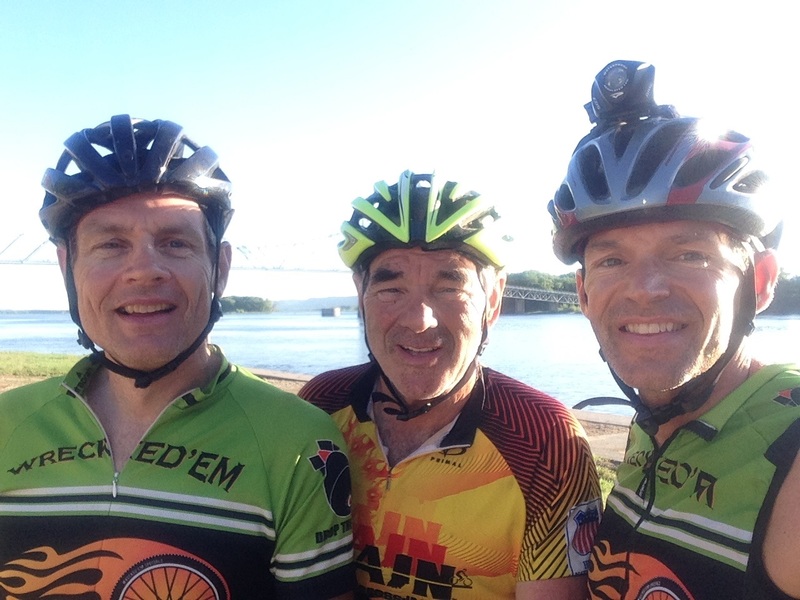 We began cursing race director Mark and begging for a view of our finish town or the Mississippi River. Finally it came (after a long, long descent) at 6:57a on the banks of the mighty river, in Lansing, Iowa. The rising sun and reflection on the river blinded us as we dismounted our ‘cross bikes and did the limbo under the cable to dip a tire in the river. Somehow we passed this cycling test – among the toughest in our careers. This final exam is incredibly difficult. It is steep and tough to navigate in the dark, so you may want to consider scheduling your TIMP so you can ride the final 47 miles in the light of day. Elevation: + 7492 / – 8192 ft.
Elevation: + 12,279 / – 12,827 ft.